First sighting of an American Kestrel fledgling. Aubrey Spring Ranch. There’s at least one other in the nest box and they’re calling to each other. Then, after he consulted with birders, he realized these weren’t the parents—they were the new offspring! I’ve just been informed by someone who knows what they’re talking about that the birds in the recent photo are fledglings, and not Boris and Natasha. I thought that at first, when I was taking the photo, but when I looked at the photo and saw the distinctive male and female breast markings I was fooled. So what we have in that photo is two fledglings — one male and one female. I suppose they need names. 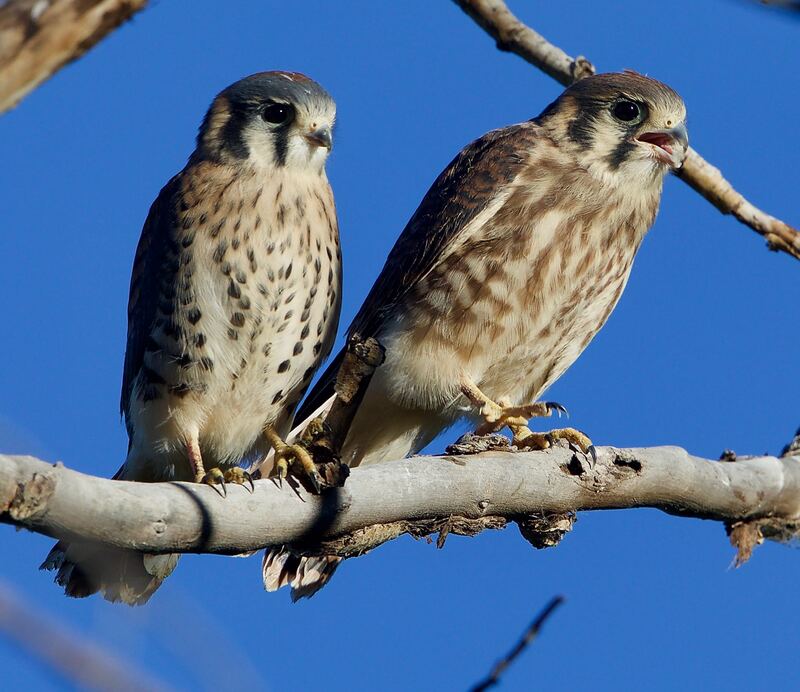 Very young kestrels. Male (left) and female (right). Note the size dimorphism: females are always larger. Yesterday’s post on the Harvard turkeys showed an individual with its snood both limp and erect. (The snood is the fleshy protuberance above the beak of a turkey.) According to Wikipedia (and various other websites like Modern Farmer and the CBC), females prefer males with longer snoods, and accordingly the snoods become substantially longer during mating season. As a side note, the online Oxford English Dictionary does not have a definition of snood corresponding to turkey anatomy. A gap in their knowledge! I grabbed my phone for these pictures back in November. 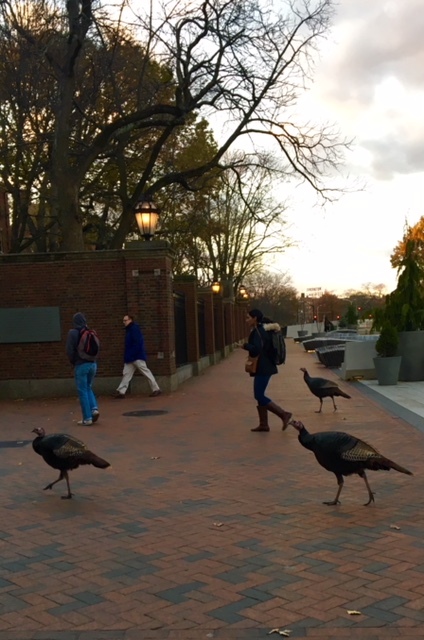 Turkeys going into Harvard campus. Not the greatest photos, but when I saw your wildlife photo today, I thought I would forward. This entry was written by whyevolutionistrue and posted on June 30, 2018 at 7:30 am and filed under birds, photography. Bookmark the permalink. Follow any comments here with the RSS feed for this post. Both comments and trackbacks are currently closed. 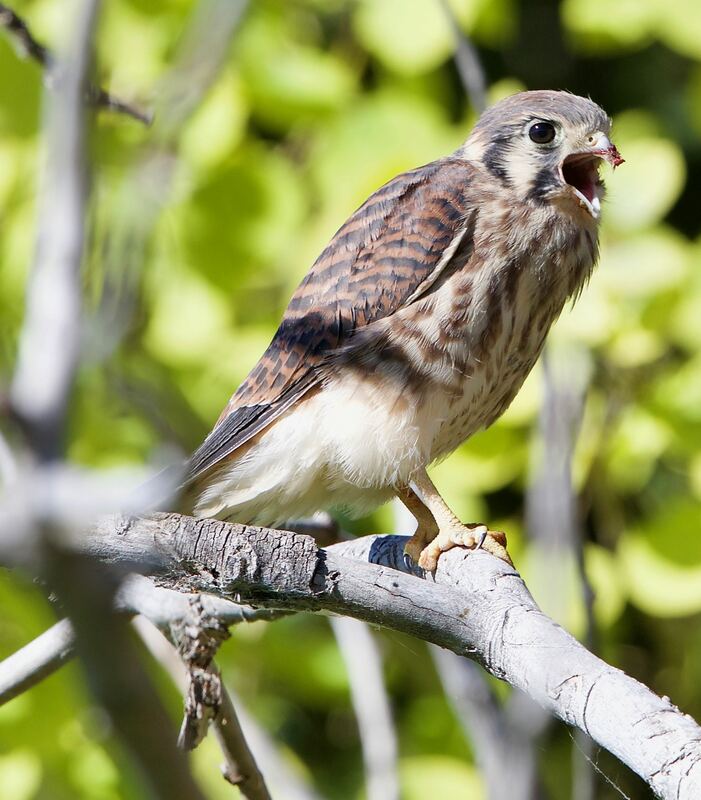 What sound(s) do the kestrels make? Is there a Sibley-format sound we can read? Do you know about xeno-canto https://www.xeno-canto.org/ “sharing bird songs from around the world”? I’m sure that I learned about this site in one of the posts on WEIT (perhaps in one of the tweets), and sometime this month, because I’d placed the link in my files, so it hadn’t slipped out of my working memory. Their call isn’t melodious — kind of a high-pitched squealing, usually when food involved. … you know the “screaming eagle” sound cliché, right? That’s a hawk. I doubt there’s another sound cliché that is a kestrel. Harvard also extends out over the bridge – i.e. the medical school. It’d be interesting to know if the wild turkeys – or shall we call them bohemian turkeys? – have made it out that way…. Ward & June (we once had the whole family in cats–including buddy Lumpy). “flexing its snood” — A new euphemism for a male on the hunt for companionship? Setting: an upscale bar where two ladies are sipping their Cosmos. In walks Mr. Tall Dark and Handsome with a confident air. He pauses to fix an inviting glance at the two who respond. For Boris and Natasha’s offspring, how about Rocky and Bullwinkle? Or Sherman and Mr. Peabody? Since they are siblings, how about sibling names? Anyone remember Jody and Buffy from Family Affair? My brother and I hated the show, so I would view these names as a bit ironic. Or how about Luke and Leia?